Family and friends of Gillian Curran, who at the age of 24 was tragically killed in December 2003 by an irresponsible driver, organised fund raising events for SCID. Brian Ellis, Gillian’s godson, climbed Ben Nevis in March 2015 and Gillian’s sister Nicola hosted a race night in May 2015 in memory of Gillian and to offer their support to other victims of road crashes. The fundraising events raised a magnificent £5037.77 which went beyond all expectations and we are overwhelmed by the generosity of family, friends and the people of Airdrie and Coatbridge. Sincere thanks to Brian and Nicola for organising these events and to the family and many friends of Gilian who supported them. 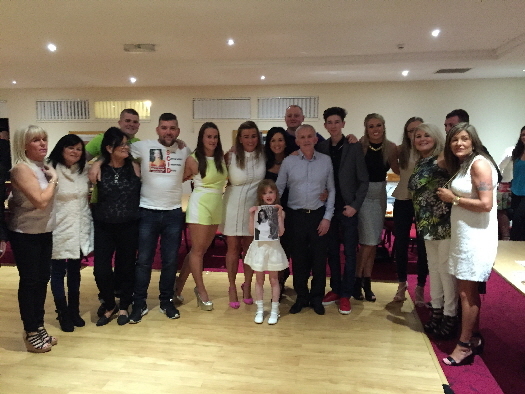 Race night with some family and friends of Gillian.